Optimizing nutritional status is a key strategy both in preventing and managing pressure ulcers. In patients across all care settings, compromised nutrition— as from poor intake, undesired weight loss, and malnutrition—increases the risk of pressure ulcers. It contributes to altered immune function, impaired collagen synthesis, and decreased tensile strength. In many cases, malnutrition also contributes to wound chronicity and increases the risk for delayed and impaired wound healing. In patients with chronic wounds, such as pressure ulcers, a chronic inflammatory state can induce catabolic metabolism, malnutrition, and dehydration. The goal of nutrition screening is to identify patients who need a more in-depth nutritional assessment and a comprehensive nutritional plan based on identified nutritional risk factors. On admission to a healthcare facility, the patient should undergo a complete nutrition screening, including assessment of pressure ulcer risk using a tool such as the Braden Scale. In the hospital setting, the nurse generally completes this initial screening. • GI signs and symptoms. If the screening determines the patient is at nutritional risk, a registered dietitian (RD) conducts a timely and complete nutrition assessment. 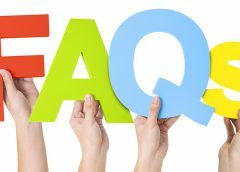 The RD determines the patient’s nutritional status and develops a comprehensive nutritional care plan in consultation with interdisciplinary team members, including the physician or a mid level practitioner, a registered nurse, and when appropriate, a speech pathologist, occupational therapist, or dentist. The RD also provides the expertise to ensure that the plan of care is based on standard nutritional guidelines from the American Society for Parenteral and Enteral Nutrition (A.S.P.E.N.) and the Academy of Nutrition and Dietetics. This plan must be individualized to reflect the patient’s comorbidities and malnutrition level. Then the RD implements the plan to address nutritional deficits and monitors macro- and micronutrient interventions until the patient’s nutritional status has been optimized. • diminished functional status, as measured by handgrip strength. Be aware that using serum inflammatory biomarkers (such as albumin and prealbumin) to diagnose malnutrition isn’t recommended. 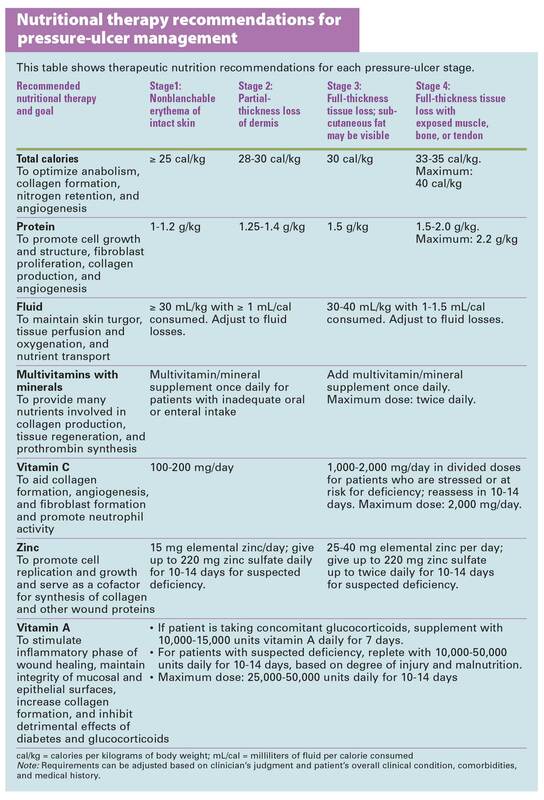 These values can be affected by inflammation, renal function, hydration status, and other factors (such as comorbidities and illness severity) and may not accurately reflect the patient’s nutritional status. Calories, protein, fat, and fluids each play a specific role in supporting wound healing. Patients with pressure ulcers require sufficient calorie and protein intake to support anabolism, nitrogen retention, collagen formation, and angiogenesis—all of which are fundamental for wound healing. The 2014 National Pressure Ulcer Advisory Panel/European Pressure Ulcer Advisory Panel/Pan Pacific Pressure Injury Alliance (NPUAP/EPUAP/PPPIA) Nutrition Guidelines recommend providing 30 to 35 calories/kg/day to adults who have, or are at risk for, pressure ulcers and malnutrition. The guidelines suggest adjusting energy intake based on weight change, underweight, and obesity. Dietary carbohydrates and fat are the preferred energy sources because they spare protein for collagen production and cell structure. According to dietary reference intakes, adults should get 45% to 65% of calories from carbohydrates and 20% to 35% from fat. No recommendations exist for carbohydrate intake based on pressure ulcer stage; however, hyperglycemia is linked to impaired leukocyte production, which impedes wound healing and increases susceptibility to infection. In patients with diabetes mellitus or glucocorticoid-induced hyperglycemia, the interdisciplinary team should maximize blood glucose control through medication adjustment and carbohydrate restriction as needed. Similarly, no recommendation exists for fat intake specific to patients with pressure ulcers. A dense energy source, fat provides essential fatty acids and carries fat-soluble vitamins. Nonetheless, its role in wound healing hasn’t been established. Protein is needed for cell growth and structure, collagen production, fibroblast proliferation, and synthesis of enzymes involved in wound healing. Pressure-ulcer healing requires adequate protein; increased protein intake is associated with improved wound healing rates. NPUAP/EPUAP/PPPIA guidelines recommend providing 1.25 to 1.5 g/kg/day of protein for adults who have, or are at risk, for pressure ulcers and malnutrition. 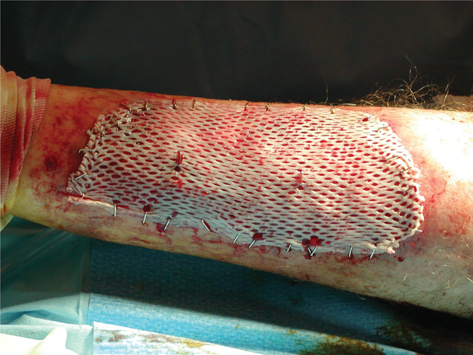 Patients with stage III/IV pressure ulcers or multiple wounds may need 1.5 to 2 g/kg/day. Those with a protein intake as high as 2g/kg/day must be monitored for changes in renal function and hydration status. 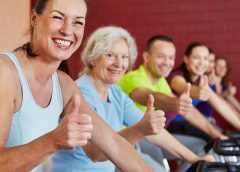 Current guidelines for patients with pressure ulcers recommend supplements of specific amino acids, such as arginine, along with high protein supplementation in patients with stage III/IV pressure ulcers or multiple pressure ulcers whose nutritional needs can’t be met with traditional high-calorie and protein supplements. According to A.S.P.E.N, recommendations for arginine and glutamine supplementation are lacking. To prevent or treat pressure ulcers, patients require adequate hydration. Sufficient fluid intake maintains skin turgor and delivery of oxygen and nutrients to both healthy and healing tissues. Current fluid intake recommendations are 30 mL/kg/day or 1 to 1.5 mL per calories consumed. The interdisciplinary team must monitor the patient’s hydration status carefully because high protein intake, fluid losses from draining wounds, elevated temperature, diaphoresis, vomiting, and diarrhea may increase fluid requirements. Micronutrients are vitamins, minerals, and trace elements that the body requires for cell metabolism in small but critical amounts. Standard multivitamin supplements with minerals are recommended for patients with pressure ulcers and inadequate oral or enteral intake. In particular, vitamins C and A and zinc play important roles in wound healing. • Vitamin C is crucial for collagen formation, angiogenesis, and fibroblast formation; it also acts on neutrophil activity. Patients with stage I or II pressure ulcers should receive 100 to 200 mg/day in vitamin C supplementation; those with stage III or IV ulcers should receive 1,000 to 2,000 mg/day. • Vitamin A stimulates the inflammatory phase of wound healing, maintains integrity of mucosal and epithelial surfaces, increases collagen formation, and inhibits detrimental effects of glucocorticoid therapy, diabetes, radiation, and chemotherapy. Patients with vitamin A deficiencies and pressure ulcers of any stage should receive 10,000 to 50,000 units/day for 10 days. Patients receiving glucocorticoids should receive 10,000 to 15,000 units/day for 1 week prophylactically to counter immunosuppression. malabsorption, diarrhea, and hypermetabolic states. For patients with zinc deficiency, supplementation at the recommended dose of 220 mg zinc sulfate twice daily for 10 to 14 days can enhance wound healing. • Liberalize dietary restrictions if those restrictions lead to inadequate nutritional intake. • Offer high-calorie, high-protein oral supplements between meals. • Consider providing enteral or parenteral nutrition support to patients who can’t achieve a satisfactory oral nutritional intake. When considering whether to implement these strategies, keep in mind the patient’s comorbidities and overall care goals. A comprehensive nutritional plan based on the latest clinical practice guidelines can improve outcomes for patients who have pressure ulcers or are at risk for developing them. All healthcare team members are responsible for optimizing nutrition for these patients. The RD is central to developing and refining a successful nutritional plan. As frontline caregivers, nurses are in a unique position to identify nutritional deficiencies, evaluate pressure-ulcer healing, and communicate assessment findings to the medical team and RD. The authors work at Englewood Hospital and Medical Center, in Englewood, New Jersey. Jill Cox is an advanced practice nurse and WOC nurse; Sophia Zigouras is a clinical dietitian. Dr. Cox is also an assistant professor of nursing at Rutgers University in Newark. Bergstrom N, Braden BJ, Laguzza A, et al. The Braden scale for predicting pressure sore risk. Nurs Res. 1987;36(4):205-10. Doughty DB, Sparks-DeFriese B. Wound healing physiology. In: Bryant R, Nix D, eds. Acute and Chronic Wounds: Current Management Concepts. 4th ed. St. Louis, MO: Elsevier; 2012. Iizaka S, Okuwa M, Sugama J, et al. The impact of malnutrition and nutrition-related factors on the development and severity of pressure ulcers in older patients receiving home care. Clin Nutr. 2010; 29(1):47-53. Institute of Medicine. Panel on Macronutrients, Panel on the Definition of Dietary Fiber, Subcommittee on Upper Reference Levels of Nutrients, Subcommittee on Interpretation and Uses of Dietary Reference Intakes, and the Standing Committee on the Scientific Evaluation of Dietary Reference Intakes. Food and Nutrition Board. Dietary Reference Intakes for Energy, Carbohydrate, Fiber, Fat, Fatty Acids, Cholesterol, Protein and Amino Acids. Washington, DC: National Academies Press; 2005. Kondrup J, Allison SP, Elia M, et al. ESPEN guidelines for nutrition screening 2002. Clin Nutr. 2003;22(4):415-21. Kovacevich DS, Boney AR, Braunschweig CL, et al. Nutrition risk classification; a reproducible and valid tool for nurses. Nutr Clin Pract. 1997;12(1):20-5. Lee SK, Posthauer ME, Dorner B, et al. Pressure ulcer healing with a concentrated, fortified, collagen protein hydrolysate supplement: a randomized controlled trial. Adv Skin Wound Care. 2006:19(2):92-6. National Pressure Ulcer Advisory Panel, European Pressure Ulcer Advisory Panel, and Pan Pacific Pressure Injury Alliance. Prevention and Treatment of Pressure Ulcers: Clinical Practice Guideline. Haesler E (ed.). Perth, Australia: Cambridge Media; 2014. Patel V, Romano M, Corkins MR, et al; American Society for Parenteral and Enteral Nutrition (A.S.P.E.N.). Nutrition screening and assessment in hospitalized patients: a survey of current practice in the United States. Nutr Clin Prac. 2014;29(4):483-90. Posthauer ME, Banks M, Dorner B, et al. The role of nutrition for pressure ulcer management: National Pressure Ulcer Advisory Panel, European Pressure Ulcer Advisory Panel, and Pan Pacific Pressure Injury Alliance White Paper. Adv Skin Wound Care. 2015;28(4):175-88. Stechmiller JK. 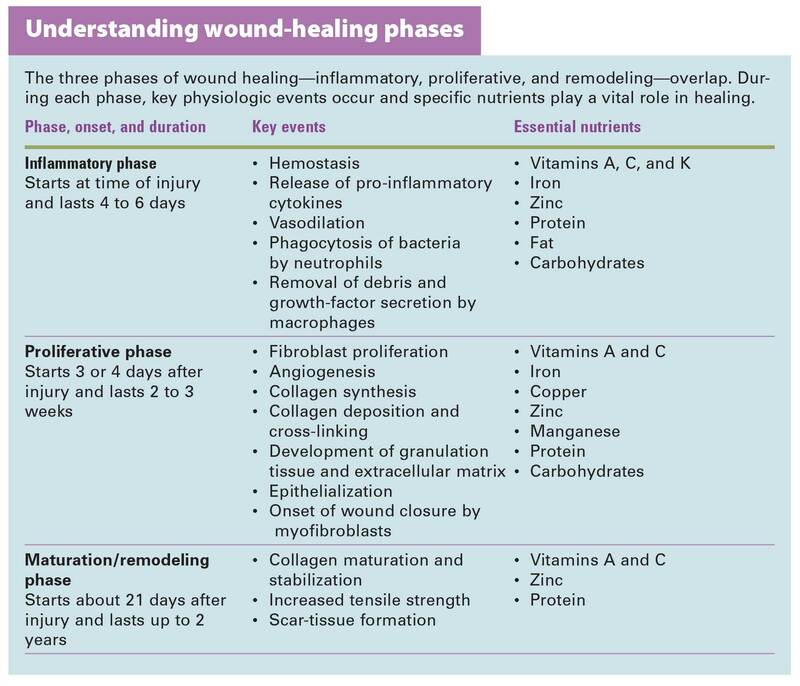 Understanding the role of nutrition and wound healing. Nutr Clin Pract. 2010;25(1): 61-8. Stechmiller JK. Wound healing. In: Mueller C, ed. A.S.P.E.N. Adult Nutrition Support Core Curriculum. 2nd ed. Silver Spring, MD: American Society for Parenteral and Enteral Nutrition; 2012: 348-63. 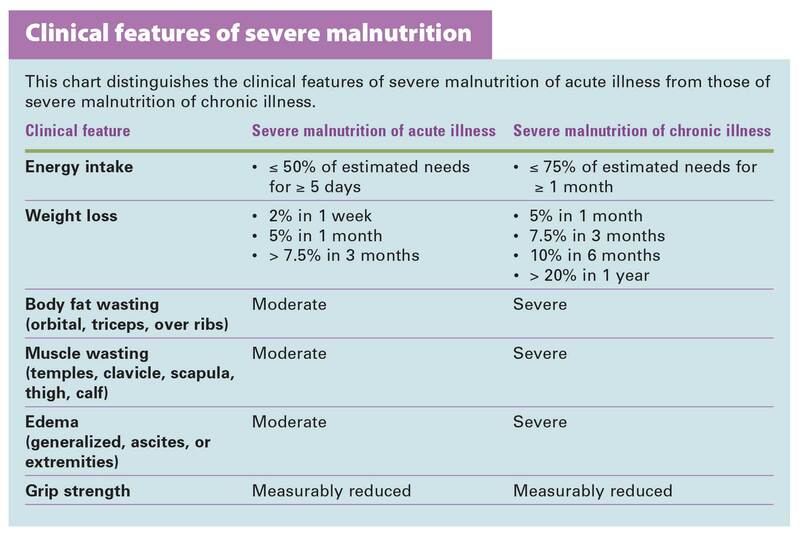 Todorovic V, Russell C, Elia M. The MUST explanatory booklet: A Guide to the “Malnutrition Universal Screening Tool” (“MUST”) for Adults. White JV, Guenter P, Jensen G, Malone A, Schofield M; Academy Malnutrition Work Group; A.S.P.E.N. Malnutrition Task Force; A.S.P.E.N. Board of Directors. Consensus statement: Academy of Nutrition and Dietetics and American Society for Parenteral and Enteral Nutrition: characteristics recommended for the identification and documentation of adult malnutrition (undernutrition). JPEN J Parenter Enteral Nutr. 2012;36(3):275-83. Exercise your right to be fit!